Home Unlabelled Drone delivery: Airborne or grounded? It's fascinating to see what ends up in our mailbox everyday. Usually it's some array of advertisements and coupons, bills that need to be paid or companies offering credit cards to "Current Resident." It's so simple to send something through the mail or to have something delivered to our front doors that it seems impossible to think that the Pony Express revolutionized the postal service in the United States just under 200 years ago. Letters and parcels used to take weeks to get to their final destinations, switching hands multiple times and hopefully making it all in one piece. Fast-forward to today where more junk ends up in our mailboxes than actual mail. We have the ability to get packages delivered in two days or less, for a small fortune in some cases. But what if we could get our mail faster? Enter the delivery drone. These machines could transport items on the day of order, rather than waiting for handling and shipping. Should this new method of delivery take off, what implications would this have for the supply chain? The term "drone" had multiple meanings throughout the 20th century and beyond. The term refers to any unmanned aircraft or a robot that can carry a small item. Drones have been in the news for the past few years, generally mentioned for wartime purposes, but they have caused quite a stir in terms of their domestic use as well. 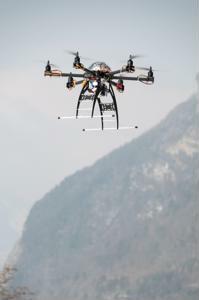 Large companies such as DHL and Amazon.com have made concerted efforts to get drone delivery projects off the ground. According to ZDNet, the European outfit of DHL tested out some prototypes to moderate success. It would seem that the tests were conducted in very mild weather and over relatively short distances. The delivery enterprise has yet to make any large moves to create a fleet of sorts, but it is certainly looking into the possibility, noted the source. Amazon, however, is not experiencing the same level of success. The company has had some trouble with the government regarding drone regulations, and the public is also split on the matter. While SupplyChainBrain asserted that Prime Air, Amazon.com's drone program, would not fly higher than 200 feet off the ground, many believe that the drones will interfere with air traffic or run into buildings trying to find the fastest route. Only time will tell if the U.S. will permit such delivery practices in the public sphere. Drone activity could have quite a few implications for the supply chain. While the creation and testing of commercial drones would create a new industry, other businesses that rely on traditional methods of shipment might find themselves in a tough spot. However, given the temperament of the government and the regulation hoops that DHL, Amazon.com et al. would have to jump through make a drone delivery fleet a futuristic thought. There shouldn't be any severe repercussions on the supply chain at this point, but drones are something that should be considered when looking toward the future. It's impossible to say what even the next 100 years will hold for technology and how it will affect the lives of our children and their children, but it is safe to assume that people will continue to tinker with gadgets and could possibly create something better and faster than drone delivery. Until then, only time will tell.